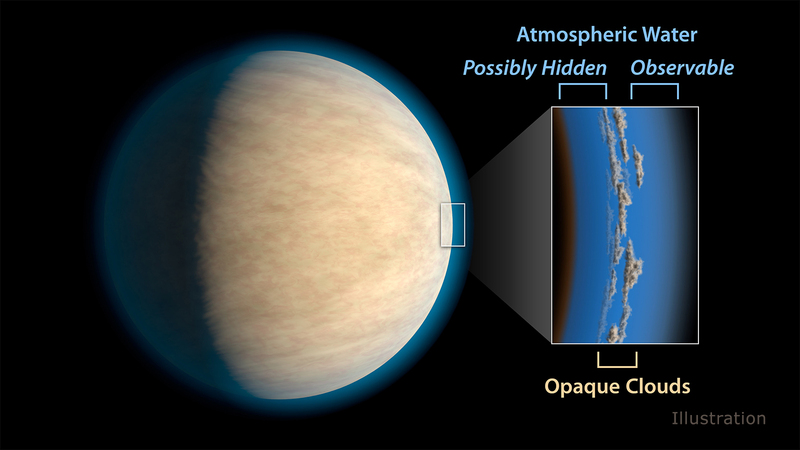 NASA’s Jet Propulsion Laboratory have put out a press release suggesting that clouds in exoplanet atmospheres might be preventing the detection of water that lies beneath the clouds, thus explaining why some hot Jupiters show signs of water while others don’t. The release is based on work by Aishwarya Iyer et al, published in the Astrophysical Journal in June. Iyer et al made a comprehensive study of Hubble/WFC3 data for 19 transiting hot Jupiters, including many WASP planets. The press release has been extensively reported, being carried on over 40 news websites. In the UK the Daily Mail covered the story, and included a note about the recent Keele University-led discovery of five new hot Jupiters, WASP-119b, WASP-124b, WASP-126b, WASP-129b and WASP-133b. This entry was posted in exoplanet atmospheres, Hot Jupiters, Hubble Space Telescope, WASP planets and tagged clouds, water on June 16, 2016 by waspplanets.